Instant Cash Canada is the right option to choose in any type of financial emergency! If you are having the financial trouble in Ontario, we can help you through car title loans Ontario! You just have to provide a clear car title, a valid Canadian driver’s license and a proof of permanent residency. We use your vehicle title as a loan collateral. There is no credit check or job verification required. We also don’t charge any extra application fee and prepayment penalties. You can borrow up to $40,000. Instant Cash Canada is the leading name in Ontario for auto title loans. We are also providing the opportunity to keep driving your vehicle for the entire duration of the loan. Our loan terms are longer up to 4 years. We have the low-interest rates and you have to pay $59/ month. 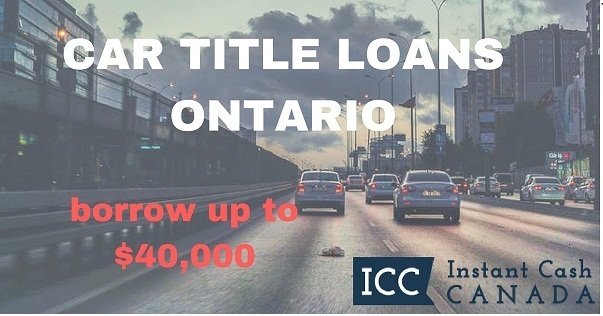 It’s Too Easy To Apply For Vehicle Title Loans Ontario! Contact Instant Cash Canada (Toll-Free) 1-866-840-7395 To Apply For Car Collateral Loans In Ontario! Above all, Instant Cash Canada is the best option when you need an emergency cash. Instant Cash Canada Can provide instant cash on the account of your car title for the longest time period. You only need to apply for Car Title Loans Ontario to get a huge amount of cash.